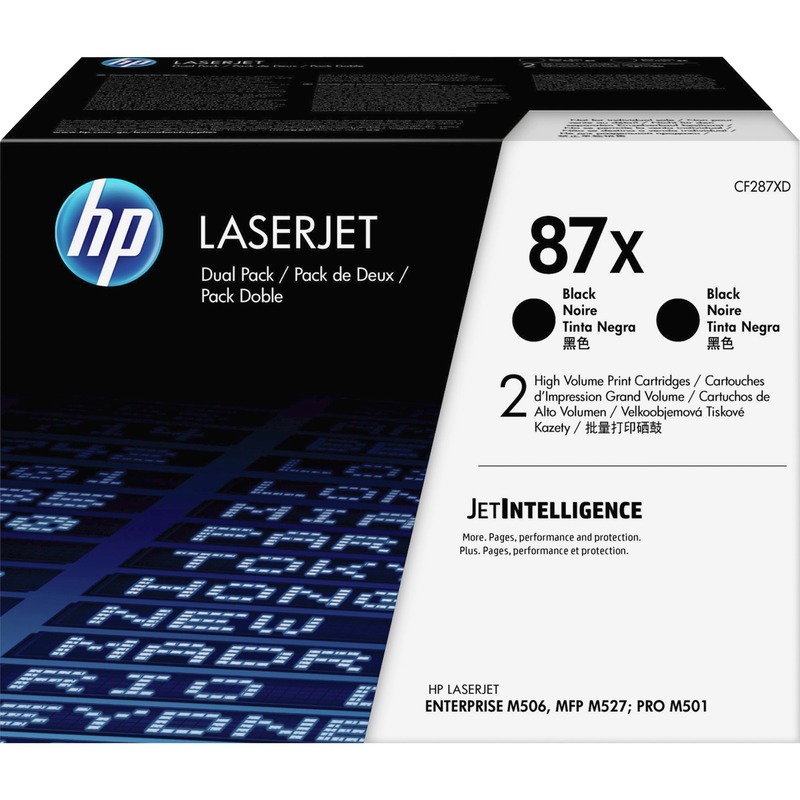 HP 87X (CF287XD) LaserJet Enterprise M506, (Flow) MFP M527, Pro M501 2-Pack High Yield Black Original LaserJet Toner Cartridge (2 x 18,000 Yield). Be confident you're getting more from your cartridge. Cost-effective Original HP High Yield Toner cartridges with JetIntelligence deliver more pages than ever before. Count on intelligent tracking of toner levels and replace less often. Count on these toner cartridges with JetIntelligence to deliver more pages than ever at fast speeds in your HP LaserJet Enterprise M506 Series, LaserJet Enterprise MFP M527, Flow MFP M527 Series and Pro M501. Page maximizer technology delivers more pages per cartridge than ever before. Intelligently track toner levels with print-gauge technology to help ensure you get the pages you paid for. Anti-fraud technology ensures HP professional quality for producing sharp text, bold blacks and crisp graphics. Quickly replace your cartridges, using auto seal removal and easy-open packaging. Each cartridge yields approximately 18,000 pages.